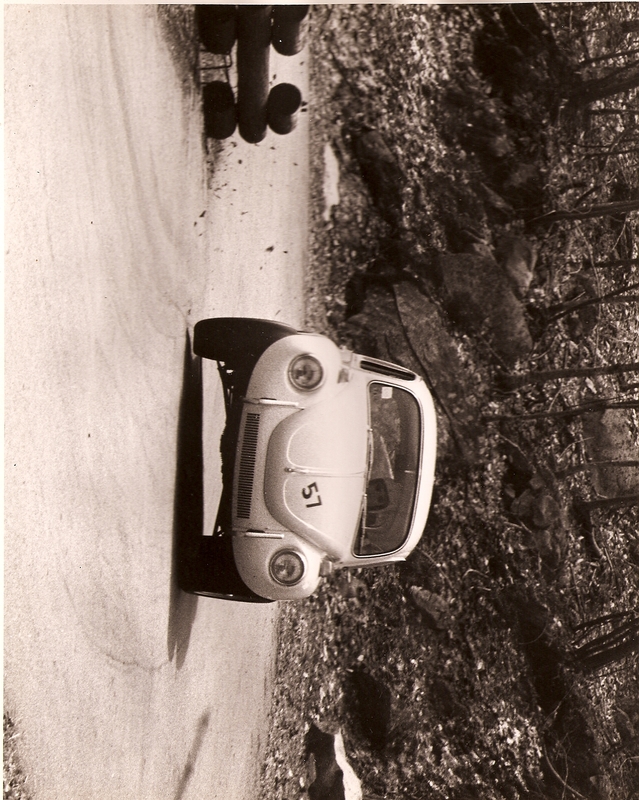 Dad two-wheeling the corner at a hillclimb race. When I was five, I owned a red and blue satin jacket covered with patches my mom had sewn on for STP oil, Goodyear tires and Champion spark plugs so I could look like a fully sponsored driver when I played in the pedal car my dad had salvaged from the dump and painted British racing green. Our whole family had satin jackets—my brother’s was red and blue like mine and also covered with patches, but my parents wore matching blue jackets with just one huge patch on the back for Corvettes of Massachusetts, the racing club they belonged to. We did not live in Massachusetts and my parents didn’t own a Corvette and never had, but apparently the club rules were lax if not just completely nonexistent. No one who belonged to Corvettes of Massachusetts owned a Corvette, and most, like my parents, didn’t even own Chevrolets, but instead drove foreign cars—VW bugs, Karmann Ghias, a Mini Cooper and a Porsche—and they raced them at tracks around New England. Road races at Bryar Motorsports Park in Loudon, New Hampshire, hill climb races at Okemo or Ascutney in Vermont, and ice racing in Newfound, NH which in retrospect seems like a completely ridiculous sport. Believing you can race with a dozen other cars on a frozen oval of a lake is a faith I’m not sure I could manage, studded tires or no. My parents raced the same car Dad drove to work—our white VW bug with red pinstriping—but on race days, Dad would pull out the front seats and put in his bucket seat that sat low on the floor with the seatbelt that crossed like an X in front of his chest. He’d change out the stick shift and steering wheel, trading them for the smaller and more stout racing equivalents, and he’d switch out the tires, carefully placing each bolt in the hub caps, which did not go back on once the racing tires were in place. Finally he’d affix a “57” on the hood that my mom had cut from black contact paper and the bug would be transformed. My dad and mom transformed too. They’d put on their fire retardant racing jumpsuits—white with blue stripes down the side—then their white helmets and aviator sunglasses, and my dad would clamp a cigarillo in the corner of his mouth. These transformations seemed so simple, so normal to me then—as simple as me putting on a blue and red satin jacket and jumping into my pedal car, pretending. I don’t remember when my parents stopped racing and we stopped going to Bryar or Ascutney or Newfound, just like I don’t remember when Bryar began its own transformation. I do remember my dad talking about how few people believed the track would ever become legitimate, ever welcome NASCAR or any of the other professional series that now race there. NASCAR in New Hampshire? Never. But all you have to do is drive down Route 106 in Loudon and there it is—the New Hampshire International Speedway—a strange monstrosity looming large in the middle of nowhere. It makes me think about the days I went there with my parents, those days I watched them do something that only seems out of the ordinary and remarkable now. I know absolutely nothing about racing anymore—not that I ever did—but I do think about how simple it was back then when my parents raced on the weekends with their friends. The car and its engine were exactly the same—the little VW bug that took my dad to work from Monday through Friday, the car that went to the grocery store and the bank and the post office—just like my mom and dad were the same inside too. And all they had to do on the weekends was slap some contact paper on the hood and put on aviator shades, and there they were, racecar drivers. It seems crazy it should be that easy to transform, but it was, and sometimes I think now it seems crazy more people don’t do that more often. Contact paper and aviator shades, plus the faith you won’t plunge through the ice. 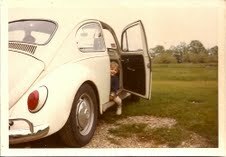 Me in the VW, before it's transformed. Kate- you know that Greg Breyer- son of the owners- went to school with us, right? I think he was a bit older than both of us- shaggy blonde hair comes to mind, but I could TOTALLY be making that up. No! Gilford is the smallest of worlds isn’t it? Those were the days. My brother Drew & I used to race with your Dad at Bryar and Mt. Ascutney and Mt. Okemo. We had a blast, that was long before we had to be overly concerned with law suits & other grief. Of course you had to take any advice your Dad gave about how to adjust our VW to compete with his with a grain of salt. Yup, Good times. Yeah, my Dad still loves to give advice–and I remember finding out years later that Ascutney and Okemo were ski areas–all that time I thought they were just other places to race!